The oceans are so big that we have long believed that nothing we could do would ever effect them. Our pollution and garbage should just disappear into the vastness. And the fish are so numerous that we should be able to harvest them at will. If the fish in one area dwindle, there should always be somewhere else to cast our nets or lines. In a similar vein, most of us living away from the coasts do not believe the oceans to be of much consequence to us. 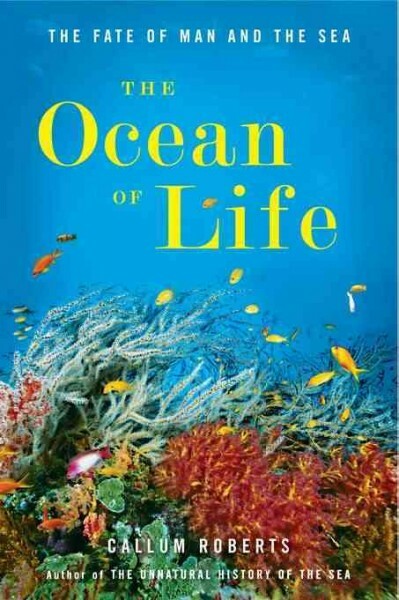 According the marine environmentalist Callum Roberts in his new book The Ocean of Life: The Fate of Man and the Sea, our assumptions are all wrong. The oceans have been absorbing our excess carbon dioxide from burning fossil fuels and various air pollutants for centuries, serving as a planetary safety valve, but now water temperatures and acidity are rising. The combination is killing the coral reefs that protect many shores from ocean storms. Warm water is shifting air currents, changing the weather of many regions. Because the air is also warming, glaciers are melting and the oceans are rising. Global warming is already here and will be difficult to abate. Also, the fish are not so unlimited as believed. Huge industrial fishing ships have systematically taken so many fish that populations of some species have crashed. While they take all the large breeding individuals, they often also destroy breeding grounds. As our world population increases, we are hampered by the constant reduction of fish caught. While Roberts excels at describing what has brought about our ocean of troubles, he is not a pessimist. He argues that we have no choice but to make the best of the bad situation - and soon. He proposes stricter regulations of fishing, reduction of the use of fossil fuels, and restoration of natural environments as the key to the survival of life at sea and on land. 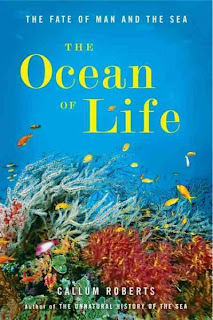 The Ocean of Life follows Roberts' acclaimed The Unnatural History of the Sea. It will appeal to readers of natural history and current events. Roberts, Callum. The Ocean of Life: The Fate of Man and the Sea. Viking, 2012. 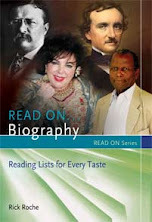 ISBN 9780670023547. Why do you condemn the rest of us as being so short sighted. Where is the proof or evidence of the following ...."The oceans are so big that we have long believed that nothing we could do would ever affect them. Our pollution and garbage should just disappear into the vastness."...... 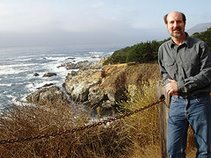 "In a similar vein, most of us living away from the coasts do not believe the oceans to be of much consequence to us." Perhaps you feel that way; however the rest of us are so not so cavalier regarding the oceans. It is one thing to document the environmental health of an ecosystem - it is another thing entirely to start out by vilifying the rest of us. I think you are reading in an insult where none is intended. As a society (including me), the general belief for centuries has been that the oceans were limitless. This is what the author reports. I have read of the same attitude in many books.